Improved ease of use for homeschoolers! Scientifically up-to-date! The Catholic Heritage Edition incorporates new scientific developments such as the six-kingdom taxonomic model; the discovery of chemosynthetic bacteria; and new advances in the study of human anatomy. Additional content includes feature pages on scientific discoveries such as Fleming’s discovery of penicillin; on contemporary issues such as the myth of overpopulation; and on Catholic scientists such as Jerome Lejeune and Paul Xu Guangqi. The workbook features a wealth of experiments, including microscope assignments and seven Formal Labs. The Formal Labs provide the student with practice in using the scientific method and in completing lab reports for controlled experiments. These formal experiments and lab reports are ideal for preparing the student for laboratory sciences at the high school and college level. 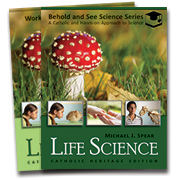 The new workbook offers improved ease of use for homeschoolers and provides student-friendly exercises, research assignments, experiments, formal labs, keywords for memorization, diagramming assignments, tests, and an expanded answer key to accompany Life Science: Catholic Heritage Edition. Bonus features in the workbook: an introduction to the compound microscope and how to prepare and view microscope slides; detailed instructions for researching, writing, and citing sources for science research papers; and an expanded Miniature Ecosystem project. Recommended core text in CHC Lesson Plans for Seventh Grade. Tour this title within the Seventh Grade Interactive Guide!